I, Frankenstein is a 2014 film written and directed by Stuart Beattie; distributed by Lionsgate; based on a graphic novel series by Kevin Grevioux. There is a war between the Legions of Hell and Divinely Created Gargoyles over the fate of mankind; a new entity is introduced. Frankenstein's Monster. Named "Adam" by the Gargoyles; who aren't entirely sure on whether he should exist; he is pursued by the demons for some purpose. After Action Patchup: Terra does this for Adam after he gets some rather large cuts sustained from fighting one of Naberius's demons. Anti-Hero: Adam, who doesn't exactly want to work for the heroes. But after he finds out Naberius's plans, he vows to stop it to prevent him from destroying mankind. A hint his good side is shown right at the beginning of the film, when Dr. Frankenstein freezes to death chasing after Adam in the mountains. And while the latter could have just left him in the mountains, he instead brings the man's body back to his house, and buries him next to his relatives. Anyone Can Die: Quite a few seemingly important characters get killed, both demons and gargoyles. Archangel Michael: The creator of the Gargoyles; only referred to, never seen. A line from the prayer the Gargoyle Queen recites while the cathedral is under siege is from the prayer to St. Michael the Archangel, composed by Pope Leo XIII. Artificial Human: Adam himself. Made of human corpses. Ascend to a Higher Plane of Existence: Gargoyles, when killed, "ascend" to heaven via a Pillar of Light. Similar to Winged Soul Flies Off at Death. Become a Real Boy: Adam grows a soul at the end, just in time during his battle with Naberius, which prevents him from being infused with a demon. Benevolent Architecture: Adam breaks into the first random abandoned building with his newfound girlfriend, and it has a medical cabinet containing supplies, a bed in the same room, tap water and an untouched fire emergency axe case). Berserk Button: Don't compare Leonore with Naberius. Seriously, don't. She puts up the Game Face otherwise. Bifurcated Weapon: The blades of Gideon's Axe can be removed and used as knuckledusters. Big Bad: Naberius, who wants to raise a demon army to subjugate humanity and take over the world. Big Good: God, though represented by the Gargoyle queen in the film, who stands in for Heaven. Bond Villain Stupidity: The wannabe gargoyle killer politely waits for Adam to climb back up instead of just finishing his initial plan of throwing him down. Captain Obvious: "I am a demon prince!" Chekhov's Classroom: Adam is told that the sigil on their weapons is what allows them to kill demons, who would otherwise be immune to it. He ends up making a small dagger with the sigil on his own after he leaves them the first time to use against the demons in close quarters combat. This method is also used to defeat Naberius, who otherwise didn't seem to be harmed by the weapons. But Adam's various cuts into his body makes the holy mark, which activates and destroys Naberius in the end. Chewing the Scenery: Bill Nighy. And they give him a nice, sharp set of teeth to do it with, too! Conservation of Ninjutsu: Anytime Adam is fighting one opponent, he usually has some difficultly against them. When they attack him in hordes however, he can wipe them out with ease. Conspicuous CG: While the CGI is fairly good, sometimes this pops up, particularly during extended gargoyle flight scenes. Creating Life Is Bad: And that's exactly why many shun Adam. Terra looks visibly disturbed whenever Wessex tells her to speed up the resurrection process to be applied to humans; it's implied that even if the technology to do so is available, she would rather not do it. Leonore, though, couldn't care less, and she even states that Adam is the living proof that God is not the sole creator of living beings. She's just mad that Adam's attitude causes many gargoyles to lose in the war. Creator Cameo: Dekar is played by Kevin Grevioux, who wrote the original comic. Cursed with Awesome: Adam lives for well over 200 years and has quite a powerful body. Unfortunately Naberius wants to find out how he was created, so as to exploit that technique for his own evil purposes. Dark Is Not Evil: The titular Frankenstein. Gargoyles take up a freakish Game Face during combat (exactly as real gargoyle statues look like in real-life), but they're still the angels of God. Several demons suffer this fate by the gargoyles descending on them from above. The gargoyles suffer this during the raid on the cathedral. Desperately Seeking A Purpose In Life: Adam, who doesn't know what to do with his life for much of the film, since he was created, rather than born. He ultimately finds it in the end, to fight against the demons that seek to destroy mankind, after finding Terra and her helping him out without any ulterior motives, and gains a soul in the process. Dual Wielding: Killing demons for over two centuries makes Adam an expert in Doble Baston Eskrima. Other characters, like Gideon, do this too though, but with bladed weapons instead of sticks (at least when they're not attached to his axe). Adam eventually uses Gideon's blades in the final battle. Due to the Dead: Even though Adam hates Victor Frankenstein for creating him, he still carries his body back to the family cemetery and digs him a grave. Evil Brit: Naberius in his guise of Charles Wessex. Being played by Bill Nighy helps. Evil Wears Black: The suits and clothing worn by the demons are mostly black. Faux Affably Evil: Naberius in his guise of Charles Wessex. Female Angel, Male Demon: Gargoyle queen, demon prince. Forever War: The Secret War fought between the demons and gargoyles. It's hinted that this battle has been raging for quite some time, and the gargoyles are slowly losing simply due to sheer attrition rates. 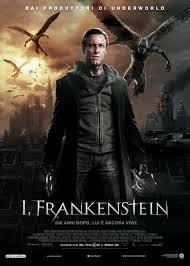 Frankenstein's Monster: The titular character. Game Face: Demons, accompanied by a lot of fire. Also gargoyles during combat. Particularly surprising is when Adam hits Leonore's Berserk Button and causes her to briefly revert to her true form. Geometric Magic: The demon prince uses pentagrams to summon souls from hell. Good Is Dumb: Not really, but their appearances compared to the bad guys are rather jarring. Gargoyles keep wearing outdated outfits and stay in a scary and antiquity-looking cathedral. Meanwhile, demons have adapted to modern times, with business suits, offices, laboratories, and the like, allowing them to blend in easily with humans. Fridge Brilliance: Why are they like that? To better attract humans (and their souls), of course! Good Is Not Nice: The gargoyles are initially friendly to Adam with the exception of Gideon, but he doesn't care much for them. Later on, after several of them are killed because of him, they're much less nice, and even attack him at times. Hanging by the Fingers: The "killer" gargoyle leaves him like this only to step back and allow him to recover. Heroic Neutral: For 200 years, the only reason Adam killed demons was because they were trying to capture him. Hoist by His Own Petard: Naberius attempts to put a demon soul inside Adam, to make him one of them. However, it only works if the reanimated body doesn't have a soul, and by that point Adam has found/obtained one, preventing the demon lord from taking control of his body. Holy Burns Evil: Demons can be killed by weapons that have a holy mark inscribed on it. Holy water works too, and Adam douses one in it after interrogating him. Humans Are Special: Humans are the only beings born with souls. Adam does grow a soul eventually, but he has to go through hell (not literally) to get it. When the Gargoyle Queen sends her guards away to fight the demons during the attack on the cathedral. The worst part is that by the time she gives that order the demons are running away so sending them to help achieves absolutely nothing. Dr Wade arranging to meet her colleague after being chased by corporate goons, and Adam letting her go. Adam not taking any new demon killing weapons after losing his sticks. "It" Is Dehumanizing: "Him, not it," as several characters insist of Adam. Just Between You and Me: The demon prince, revealing the existence of other similar body banks around the world. Knight Templar: The gargoyles have tendencies towards this; especially Gideon, although their queen makes peace with Adam in the end. Knuckle Cracking: Adam after waking up from his After Action Patchup. Leave Him to Me: The big demon guy when Adam "infiltrates" their hive for the second time. Subverted when he's picked up and killed off by a gargoyle. Let's You and Him Fight: The gargoyles are understandably angry with Adam, since he's caused the deaths of so many of them, either directly or indirectly when the demons assaulted the cathedral. So when he shows up again at the end of the film, they chase him down, only to stop when they realize he was working with them and led them to the Big Bad's hidden base. The first thing that clues you in to the true nature of Wessex's two scientists is that they wear white lab coats, in contrast to the black suits worn by Wessex and his security team; they work for him oblivious to his true nature and truly believe they're working to save the human race. The Gargoyles (who are actually angels), whose spiritual essences glow in bright blue light. However, they're also very much on the Knight Templar side, so Light Is Not Good also applies to some of them. Lightning Can Do Anything: It's a movie involving Frankenstein. What do you expect? Though this does edge farther into Hollywood Science territory than normal when the scientists working on their own modern reanimation experiments comment that the amount of electricity Adam has flowing through him would make him the next best thing to immortal and invincible. Not literally lightning in this case, however; Frankenstein used electric eels as a power source, and the modern experiments use generators. Load-Bearing Boss: Naberius's demise conveniently destroys his facility, along with all the resurrected bodies now possessed by demons. This helps the gargoyle queen immensely, as she and her two guards weren't destroying them fast enough to stop him. Justified with some Fridge Brilliance. Every demon that has been descended previously in the film has left a small hole, which appears to be bottomless. Naberius is A) the most powerful demon we have seen descended so far, B) in the act of opening a giant gateway to hell (it's where the possessing demons are coming from). and C) descending Naberius also descends all the demons he was summoning, which number at least a couple hundred. Put it all together, and a massive gaping hole eating the entire building makes perfect sense. Meaningful Name: Leonore names Frankenstein's creation "Adam", as he is the first (and so far only) human to be created not by God, but a human. Moral Event Horizon: Invoked and subverted at the same time; Gideon believes Adam's crossing point was killing him ("God will surely damn you"), but Adam believes his own crossing point was much, much earlier ("He already has"). The immediate subversion is that Adam is an Anti-Hero; the second, and greater, subversion, is when Naberius attempts to have him possessed, only for Adam to "grow" his own soul. Moral Myopia: The moment above started because Gideon tried to kill Adam, then has the gall to complain when he loses that fight. Mr. Fanservice: A shirtless and buff Aaron Eckhart is certainly easy on the eyes. Neck Lift: Happens to Adam a few times. He does it to some demons as well. Neck Snap: Naberius kills Carl with one of these. Never My Fault: Gideon constantly blames Adam for the casualties the gargoyles suffer, even though at every turn Adam is only defending himself and the gargoyles captured and imprisoned him simply because a human happened to be killed. Nice Job Breaking It, Hero! : Adam attempting to interrogate a demon in a dark alley causes an innocent policeman to try and stop him. He's "rewarded" with said demon escaping, and snapping the officer's neck before fleeing the scene. The gargoyles later blame Adam for the death, even though he didn't directly kill the guy. Nice Job Fixing It, Villain! : Adam invokes this about his creator, pointing out that his achievement gave Naberius all he needed to advance his own schemes. Adam: Naberius has been planning this for centuries. Victor Frankenstein just made it possible. Not So Different: Adam calls the Gargoyle Queen on imprisoning him, calling her no better than Naberius for taking away his freedom when it suits her. Number of the Beast: 666 Legions of demons were released by Satan when he rebelled. An Offer You Can't Refuse: Both the Gargoyle queen and Naberius try to reason with Adam to work for them. However, he's not interested in either proposition because they're not really offering him anything he wants. So both of them end up trying to use brute force to gain control of him at various points. One-Man Army: While the gargoyles do help occasionally, Adam kills quite a few demons on his own. The only time he seems to have trouble is if he's fighting exactly one. Our Gargoyles Rock: They're actually angels, which take the form of bird-winged, stone beasts when fighting and spend the rest of their time in human shaped, left on earth after the battle between Heaven and Hell went elsewhere. Possessing a Dead Body: The demon prince Naberius' evil plan is to stockpile human corpses, then, through a combination of his own demon magic and the research of Victor Frankenstein, summon the souls of slain demons to inhabit them and reanimate them as an army. Quantity vs. Quality: The demons (quantity) vs. the gargoyles (quality). The demons started out with 666 legions when The Devil first released them. It's unclear how many gargoyles were created by Archangel Michael, but it can be assumed that the number is significantly lower. The number of gargoyles shown in the film is a few dozen, although there many more gargoyles in other parts of the world. One gargoyle can kill a dozen demons, but the gargoyles don't get reinforcements while the demons can use Demonic Possession on those who have sold their soul. The gargoyles also have the undisputed advantage of flight. Our Souls Are Different: Only (living) humans have souls, which are what set them apart from other beings. Demons don't have one; even gargoyles are implied to not have it, if Leonore's saying is any indication. Human souls will leave to the afterlife after they die, leaving the bodies empty making them susceptible to being infused by other beings, such as demons, if they are resurrected. Because Adam is made from human corpses, he is born without a soul. However, he gets to grow a soul at the end, probably because his resolve impresses God so much to make him earn it. Really 700 Years Old: Adam was created in 1795, and is still going strong to the present day. An internal power generator is implied to cause it. Gargoyles and demons, meanwhile, are much more than that; see Time Abyss below. Red Eyes, Take Warning: When Naberius is pissed off while masquerading as Charles Wessex, these appear. When Wessex offers Adam help and a chance to find the answers he's looking for, when Adam grabs Wessex's wrist to stop the man touching him, he catches sight of the red eyes and realises who Wessex really is. Scare Chord: Adam gets confused by moths in the abandoned building. Scary Black Man: Dekar — naturally, being played by co-creator Kevin Grevioux. Secret War: Between the gargoyles and demons. Of course, the gargoyles come off as a little hypocritical when they chain Adam in their church/fortress for having a scuffle in an alley that results in the death of a policeman, only to immediately afterward engage in a gigantic flaming street fight with their demon enemies with fire spirals and pillars of light erupting in about a three-block radius from the church. Somehow, people still don't notice. Sequel Hook: One of the demons working on the reanimation project successfully flees with a USB stick and all the research they did, meaning they can potentially recreate the process in any of the secret bases mentioned by Naberius. Shapeshifting: By both demons and gargoyles; both have human forms. To Mary Shelley's Frankenstein. Dr. Frankenstein uses electric eels instead of a thunderbolt in this movie too. To the original 1931 film Frankenstein: When the gargoyles first find the monster, the female gargoyle who went to check on him shouts, "It's alive! It's alive!" much like the doctor in the film. Much like Dracula in Van Helsing, the Big Bad's plan is to use Victor Frankenstein's research to create an army (although one consisting of demon-possessed corpses rather than vampires). Sigil Spam: Gargoyles have a weakness for this. Their demon-killing symbol is used on their weapons, their clothes, on carpets and various furniture, as a jewellery, as a lightning conductor and so on. This makes some sense, as it is basically demon kryptonite. This is also how Adam defeats Naberius, who was resistant to marked weapons. By cutting the symbol onto his chest, Adam kills him by essentially turning Naberius into his own poison. Spiritual Successor: To the creators' Underworld films. Swiss Cheese Security: Both bases suffer from this. The demons' base gets infiltrated twice by Adam and once by a trio of Gargoyles; the Gargoyle's castle complex gets quickly infiltrated by demons that can't even fly (well, maybe fall with style, but still). However, in the case of the Gargoyles, they are ridiculously outnumbered, so they could only fend off so many at once before getting overtaken by the sheer numbers of demons. Villainous example in when the demons assault the gargoyle's cathedral in vast numbers. Their goal was to capture Adam, or failing that, kidnapping the gargoyle queen and ransoming her for Adam. Straight example used at the end, when Adam deliberately leads the gargoyles to the building being used by the demons. Time Abyss: The gargoyles and demons, naturally. Demons were released by Satan shortly after his fall, and gargoyles were sent by Michael to fight them. That started a looong time ago. Gargoyles stay in their antiquity-themed castle and outfits, but demons have adapted to modern times, complete with some fancy dress suits and laboratories. The Soulless: Demons can only possess soulless bodies. Adam is considered this, which is why they want more of him. This property also allows him to kill Gideon, but he "grows" a soul before Naberius can have another demon possess him. The Unfought: Dekar prepares for one-on-one combat with Adam, only to be unceremoniously snatched off his feet and killed by a gargoyle. Tempting Fate: Terra says she doesn't believe Adam about demons and gargoyles because it seems ridiculous. Then a demon shows up, and shows off his demonic face right in front of her. Him beating Adam up pretty good convinces her that maybe he wasn't lying. They Died Because of You: Adam accidentally causes the deaths of many of the gargoyles. Some of them make sure to let him know that, such as Gideon. This Cannot Be! : Naberius's reaction to discovering Adam has a soul, rendering his efforts to have him possessed useless. Title Drop: Very end of the series; Adam takes his father's name. Together in Death: After Ophir is ascended by the demons, Keziah is wounded by one of them. When Adam attempts to care for her wounds, she insists that he let her ascend, as they have wanted to be together for centuries, but the order frowns on fraternization. They can finally be together in Heaven. Urban Fantasy: A war between the Legions of Hell and gargoyles, with the modern world as its setting. Voice of the Legion: The demon prince loves this perk of his. Weaksauce Weakness: Demons can only be killed by a weapon with the symbol of the gargoyles engraved on it. Pretty much anything will do. Gargoyles can only be killed by a soulless being, like demons and Adam until near the end, and it appears that just clawing at a gargoyle is sufficient to ascend it. We Hardly Knew Ye: Ophir and Keziah, the two gargoyles who rescue Adam at the beginning of the film. Both of them are killed when the demons assault their cathedral about a third of the way into the film. We Have Reserves: Zuriel arranges a large-scale attack on the the gargoyle cathedral in a gambit to get Adam. It's unclear how many demons were committed to the battle, but the first wave had fifty of them and more came after that. Interestingly, Naberius seems to actually care that so many demons are going to be "descended" back down to Hell. He has to remind Zuriel, who is more than willing to sacrifice their lives, of the suffering awaiting the casualties. If nothing else, he does not want all these demons sacrificed for nothing. We Need a Distraction: When one of the demons has Adam nearly subdued, he taunts him by stating that now that they have the journal, they don't need him alive anymore. Terra then immediately stops him, and tells him he's more valuable alive, where she can conduct research on how his body is functioning at all. This buys Adam enough time to pull out his holy dagger and stab the demon, descending it to hell. Adam refusing to cooperate with the gargoyles ends up causing many of them to die when the demons attack the cathedral. Particularly after he kills Gideon in self-defense. Gideon after he retrieves Frankenstein's journal in exchange for the gargoyle queen being held hostage by the demons. Fortunately they hold up their end of the bargain and release her, and Adam chases after the demons to retrieve the journal shortly afterwards. What Happened to the Mouse? : Carl. He is killed by Naberius in order to force Terra to help reanimate his demon army. We see him in the reanimation tube, but we never see what becomes of him after the final battle. Presumably he wasn't resurrected.. Winged Humanoid: Gargoyles. When they turn to their human forms, their wings take a form of capes and such. You Have Failed Me: Averted. Despite one of the demons running away instead of trying to capture Adam, Naberius merely strikes the underling and tells him to do better next time. Justified, since there have only been 666 demonic legions on earth from the beginning, and they have sustained too many losses over the centuries to kill underlings so frivolously. Naberius kills Carl deliberately after Terra refuses to use Frankenstein's methods to resurrect the dead bodies he's acquired over the centuries. She is then forced to use said methods to save him, and Naberius immediately uses it to raise his army of demons. He then tries to kill her too, but Adam manages to save her before she hits the exposed electric tube she used in experiments earlier. Though Adam is initially wanted alive, Zuriel decides to kill him since they now have the journal which is far more informative than merely studying Adam. Fortunately, Terra provides a distraction and claims he's much more useful alive for experimentation purposes, allowing Adam to recover. Zuriel: You know the best thing about the journal? I no longer need to bring you back alive! Zerg Rush: A tactic used by the demons while attacking the gargoyle's cathedral.